#Mmmunchi: Inpsired by every game you ever played. A prototype demo of this ultimate 2d platformer is now available for pc & Android. 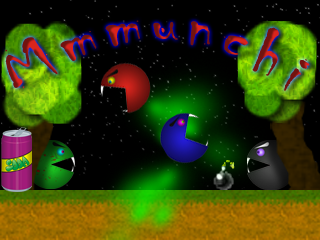 Experience Mmmunchi in the infancy of its development. No more traditional menu systems. In our game you control the character and summon a portal to start, load, save or exit the game. However in the prototype you will only be able to start the game and exit. More options will be implemented in a future release. Pickup Food & Drinks restore all bars. Pickup bombs to add them to your inventory. Controls are indicated on screen for a limited amount of presses, you can extend the amount by going to the help portal on the main menu world.